Preserving church records is a key responsibility of PC(USA) stated clerks and clerks of session. The society offers services to assist you. The Book of Order charges clerks with the "permanent safekeeping" of all official records. Certain types of records are deemed permanent because of their legal, administrative, or historic nature. 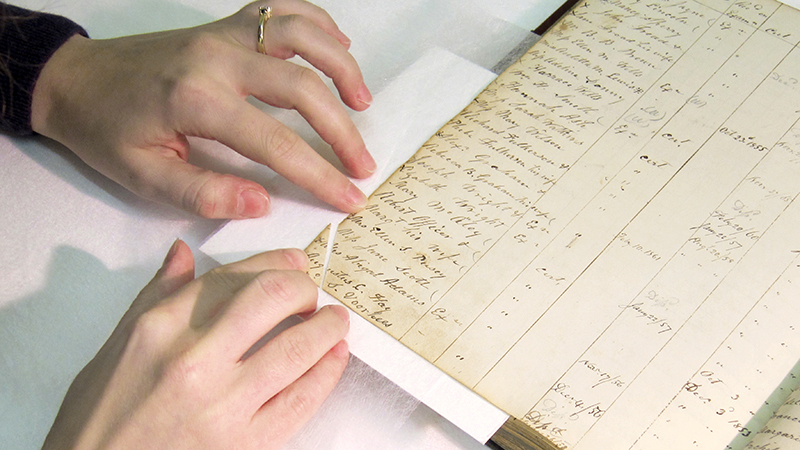 Permanent records document many aspects of the historic development of the denomination and the commitment to the community of faith. In addition, they are valuable in understanding legal and financial developments and have ongoing administrative uses within the synod, presbytery, congregation, and national office. Just like physical records, some electronic or "born-digital" records are deemed permanent and must be preserved. Digitization services are available at a subsidized rate for all PC(USA) congregations and mid councils. The digital surrogates we generate from official records are preserved permanently onsite. By refreshing carriers, migrating files to preferred formats, and emulating software, we preserve the bitstream, appearance, and functions of digital objects. Storage for permanent records in our secure, climate-controlled archives is strongly encouraged and available free of charge to PC(USA) congregations, mid councils, and national agencies. Learn more about the causes of deterioration and how to prevent it. Find resources on preservation topics and vendors of preservation supplies. 13 hours 54 min ago. Today’s #HistoricalFigureFriday honors Reverend James Patriot Wilson. Born in 1769 in Lewes, Delaware Wilson went on to graduate from the University of Pennsylvania in 1788. He initially studied law and was admitted to the Bar but the unexpected death of both his wife and brother led him to a religious path. He was ordained as pastor of the Presbyterian Church in Lewes in 1804 and in 1806 he accepted a call to lead the First Presbyterian Church in Philadelphia. He resigned as a much celebrated pastor in the spring of 1830 before he died December 9th 1830. Our portrait of Reverend Wilson was painted in 1807 by none other than James Peale the younger brother of Charles Willson Peale. This oil on canvas painting represents one of the many large portraits James Peale completed after he shifted away from miniatures. To see more works by James Peale visit PAFA The Pennsylvania Academy of the Fine Arts or the Philadelphia Museum of Art.